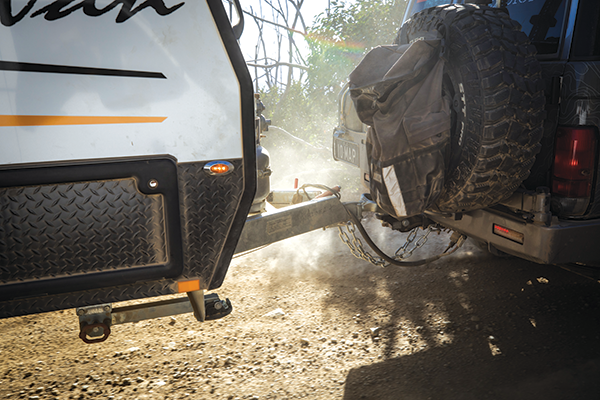 Welcome to Part 2 of AL-KO’s Toughest Tow Test – the offroad odyssey! 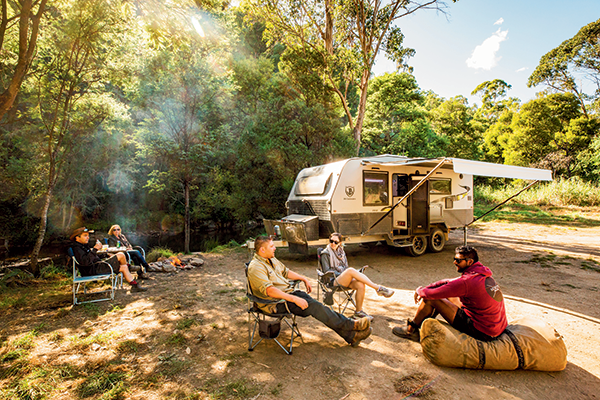 Last month, we took you along on the onroad journey from Dargo to Mansfield, in Victoria’s spectacular High Country with two onroad caravans, sporting onroad AL-KO suspension and couplings, in tow. 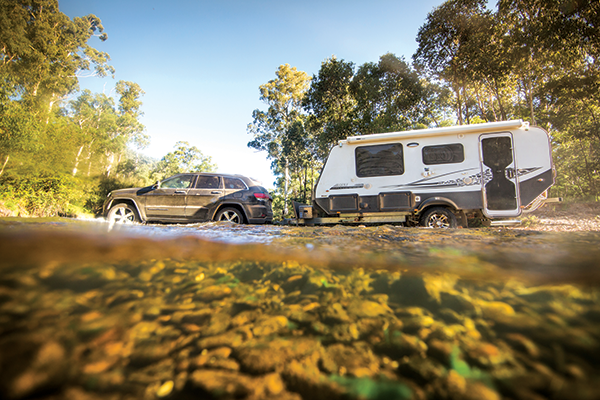 We pushed these caravans to the limits of what onroad caravans are commonly expected to do, and took them places most caravanners would never venture to – and the results were impressive. The first leg of this trip was epic, but not in a white-knuckle, chew-holes-in-your-seat kind of way. And there’s only so much you can see by sticking to the blacktop and the light corrugations. So when we got to Mansfield, we exchanged the onroaders for a tougher breed of offroad and adventure-ready caravans – a Coromal Pioneer XC towed by AL-KO’s Toyota LandCruiser 200 Series with engineer Craig Greenaway behind the wheel, a JB Caravans Scorpion towed by AL-KO’s southern region state manager Graeme Radford in the driver’s seat of a Mitsubishi Pajero, and a Golf Savannah 499 towed by a Jeep Grand Cherokee driven by Jeff Jnr from Avan. 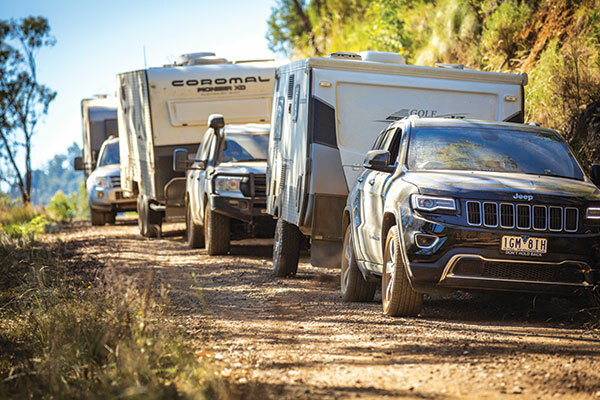 These 2-3 tonne warriors were all fitted with AL-KO’s top dog suspension, the Enduro Outback independent trailing arm system which, according to AL-KO, is built to handle absolutely anything you can throw at it. And, I’m pleased to say that we threw more challenges at it than Shane Warne has thrown spinners! The Golf and the Coromal were also fitted with AL-KO’s new Off-Road Ball Coupling which, at the time, had not yet been released to the market. The new coupling is designed to fit over a standard 50mm ball, and be easy to use but provide extreme articulation for offroad work. Our mission was to tackle the best-of-the-best that the Vic High Country has to offer, between Mansfield and Mount Hotham. 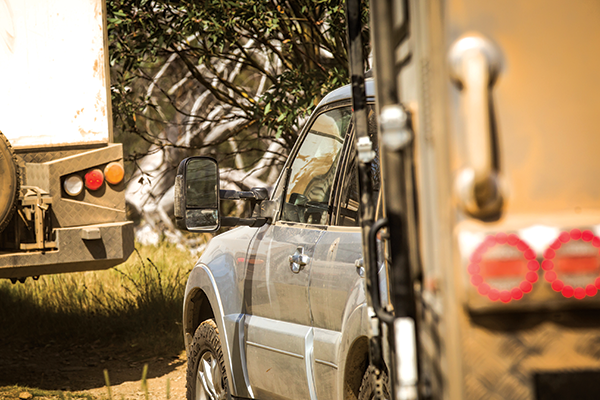 Our Toughest Tow Test partners Hema and Clearview stuck around to keep us on track for Part 2, with the Hema Map Patrol LC76 taking on recovery duties and Clearview’s extendable, replacement towing mirrors providing excellent towing vision for most of our convoy. From a small campsite in Whitfield, near Mansfield, we headed north-east to Tolmie, then on through Mt Buffalo National Park (NP). We crossed Lake Buffalo at the dam wall, then disappeared into the scrub at the Goldie Spur Track. This section of the Tow Test really put the vans but, more specifically, the vehicles, to the test as we encountered steep, rocky climbs and hairpin switchbacks. It was here the Pajero nearly met its maker! But the caravans ate up the landscape as if it was nothing. 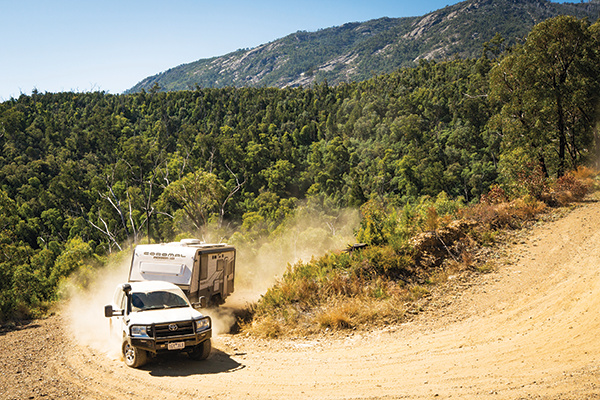 Down in the Buckland Valley, we really put the vans’ suspension to the test with a series of steep and rocky crossings of the Buckland River before heading on to Bright to camp. 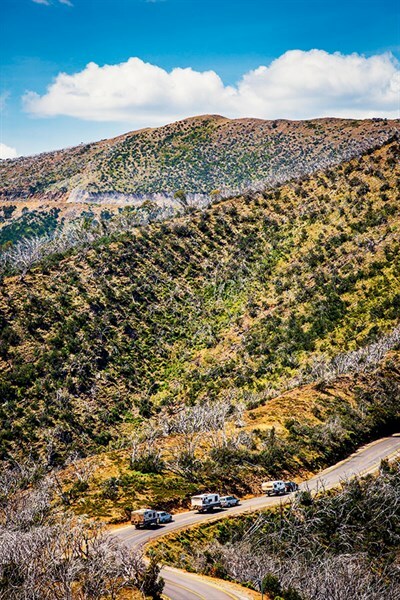 The next day, we climbed up to the spectacular (but blacktop) Great Alpine Road up Mount Feathertop to Dinner Plain, before disappearing back in to the scrub again reaching Precipice Plain – our final destination. Anyone in their right mind would be a little nervous about tackling most of these tracks with a caravan in tow – the tracks are rocky, dusty, steep, bumpy, tight and downright insane, while the caravans are generally long, heavy, wide! Over the three days, we tackled river crossings galore, which not only had the suspension working hard but the poor blokes behind the wheel had a few heart in throat moments, too. One thing’s for sure, the offroad coupling was worth its weight in gold on some of these tracks. Some of the angles those caravans got on would easily be enough to snap your average on-road coupling in two, so we’d probably still be swinging spanners and scratching our heads on the side of the track without it! Some of those water crossings had pretty tricky exit points to negotiate, too. There was one particular instance I thought we were absolute gonners! But thanks to some handy wheel work, some great spotting and, of course, suitable equipment for the job, we all made it through in the required number of pieces. I’ve seen my fair share of inferior suspension setups rattle to pieces under this kind of pressure in the past. 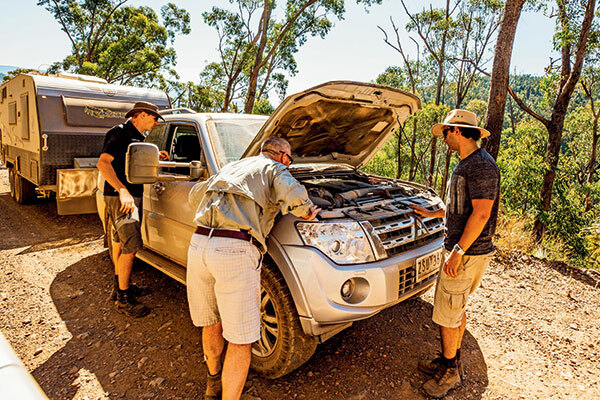 It’s not until you see a product like the Enduro Outback lay down the law on a real-world, offroad adventure in person, that you realise just how important it is to have quality running gear under your caravan. In fact, I’d go as far as saying this equipment saved the day – on more than one occasion, and I’m confident in saying the suspension is the main reason we made it through unscathed. But the real knuckle-biters were those steep hills the High Country is so renowned for. These climbs will take their toll on most 4WDs, but lug a 2-3t caravan behind and things rarely go to plan. Halfway up Mount Buffalo, the mighty Pajero fell victim to a trip-halting overheating issue. It had us scrambling around the engine bay like ants on a honey jar for a little while, and not long after we got it all sorted, the Jeep busted a tyre. But you know what? 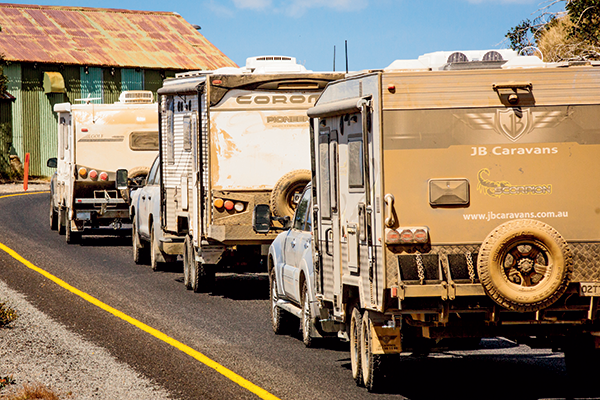 The caravans were rock steady with no failures at all between them. And it was all worth it in the end. The camaraderie between everybody on the trip reached a new level, and the scenery we found was nothing short of spectacular. 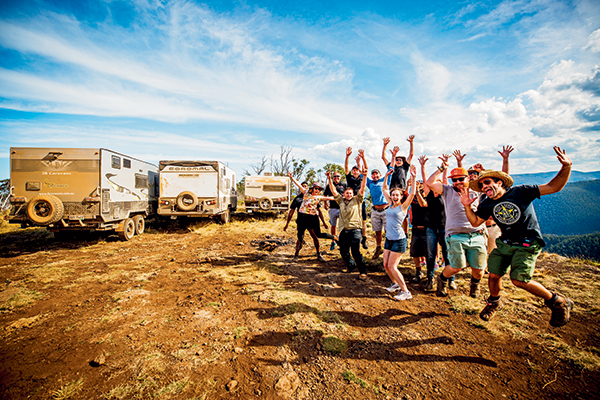 Mountains of granite set the stage for an evening of reminiscing about the day’s events, and tired aching bodies let the best of us know we had just conquered more corrugations than we realised at the time.